Today, I'm extremely happy. Wanna know why? It rained this morning and the weather is so pleasant. After months of blistering summer heat, this is a welcome change. I've been waiting for the rains for a while now. I still have a couple of summer recipes that I haven't yet posted, but seeing as to how summer is just kicking in in some parts of the world, I'll post them over the next few days. Get ready to see a few more baked goodies now. I'm so happy I can comfortably use my oven again. But before we get there, I must tell you about this awesome Vanilla Bean Ice Cream I recently made. I mentioned it here and then almost forgot about it. This morning, while going through some pictures, I happened upon the ones I'd clicked of the ice cream and realized I hadn't posted it yet. So here goes. This is a little more complex than the other ice cream recipes I've made in the past. All the previous ones have been simple, no churn recipes. This, however, requires you to make your own custard. In the past, the thought of making my own custard had intimidated me big time, but I wanted to get over it, so I followed the recipe down to the letter and managed to whip up a wonderful custard. The process really was quite simple and left me wondering what all the fuss was about. This ice cream was like none I've had in the past. It had a lovely taste, so much more like custard that the commercially available vanilla ice cream. I think it should be called frozen custard or something like that. Needless to say I enjoyed it very much and I hope you do too. Since I don't have an ice cream maker, I simply froze it and when it had almost set I whipped it a couple of times every couple of hours, to try and get a creamier texture. If you do own an ice cream maker, by all means take advantage of it and use according to manufacturer's instructions. Don't forget to enter my cookbook giveaway, if you haven't yet. The giveaway ends on 10th June 2012. Slit the vanilla pod and scrape the beans into the milk, using the blunt edge of the knife and then drop the pod in too. Bring the mixture almost to a boil - this is known as scalding. Turn the heat off before the mixture comes to a boil. Leave it to rest for about 30 minutes so that the vanilla infuses its flavor into the milk. Beat the egg yolks and the sugar well. It should be light and fluffy. Pour the milk through a sieve into the beaten eggs, stirring well till you get a thin custard. Pour this custard into a clean saucepan. Place the pan on moderate heat and stir continuously using a wooden spoon, bringing it slowly towards a boil. Once the custard is thick enough to thinly coat the back of the wooden spoon, your custard is ready. Take it off the heat and pour it into a cold container and leave it to cool. Without ice cream maker - Once it has cooled, freeze for a couple of hours and just before it has set, whisk it up again. You can use a blender for this. Repeat this once or twice again every couple of hours. 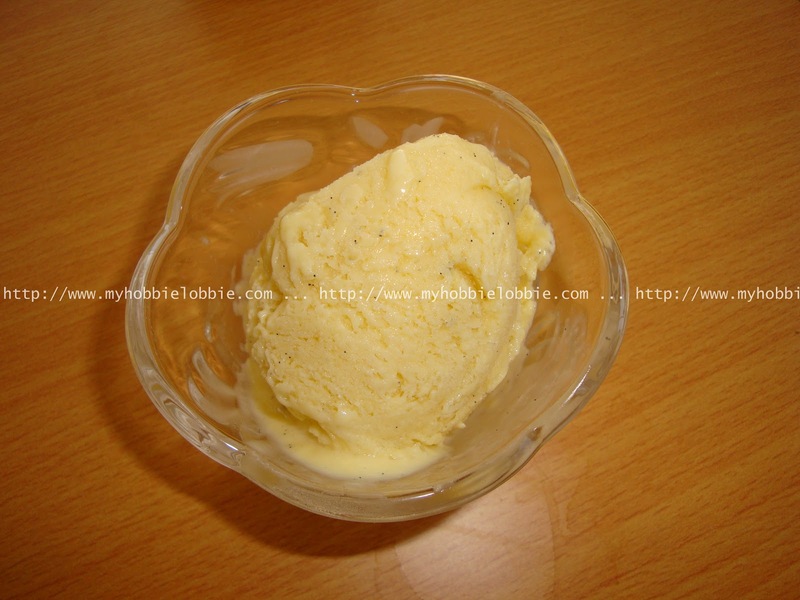 With ice cream maker - Once it has cooled, refrigerate for half and hour before churning. Pour into the ice cream maker and follow the manufacturer's instructions. Note - I thought I should mention the cautionary note by Nigel. Since I don't have any prior experience with custard, I am in no position to offer you my opinion, but I think its important that you have this tip handy. He says and I quote "The custard must not reach boiling point, but should start to thicken before it gets there. If you overheat the custard it will curdle (I guarantee), so make certain that the spoon gets right into the corners of the pan. Your most helpful utensil will be a sink of cold water. If there is even the remotest sign of curdling, quickly dunk the pan into a sink of cold water to cool the sauce down and whisk like you mean it." Vanilla Bean Ice Cream looks delicious. This would work with essences and extracts as well. Even in Mumbai, vanilla beans aren't easily available, and if they are, they cost a bomb. I'd picked up some on a previous trip I'd made where these pods were plentiful. I always keep a watch out for stuff like this when I travel. We're rapidly approaching our hot days of summer, so I will have to flag this recipe and give it a try soon. It sounds absolutely delicious and rich. Thank you for sharing it!